Catapults are mechanisms that were widely used in medieval warfare to attack and defend. They were originally constructed to hurl missiles, such as spears, but were later used to throw large stones and pots of boiling oil at the enemy. Catapults have even been used in modern times to launch aircraft from warships. 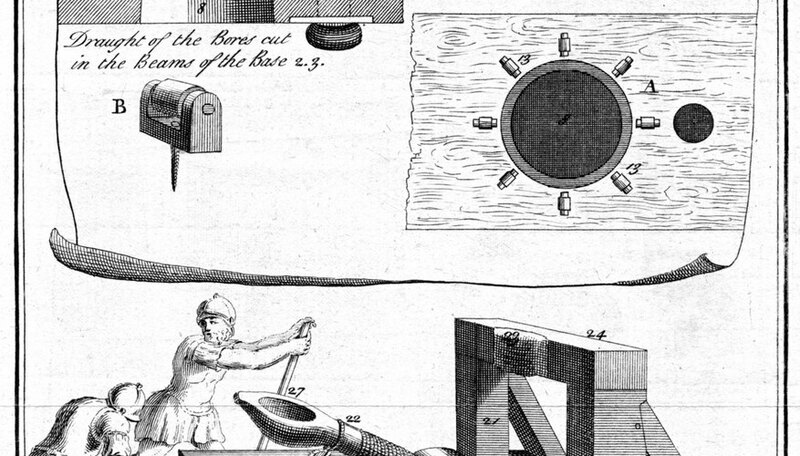 Making a model catapult with your child can be an enjoyable way to help him understand this piece of history -- while launching golf balls instead of boulders. Smooth the edges of the block of wood and the small cube of wood with the sandpaper. Lay the larger piece of wood on one of its 2-inch sides, then glue the clothespin to the wood lengthwise, making sure the clothespin is centered. Allow it to dry. Glue the 1-inch wood cube to the top of the open end of the clothespin, making sure the cube is centered. Allow it to dry. Glue the jumbo craft stick to the wood cube, matching one end of the craft stick to the edge of the cube that is closest to the closed end of the clothespin. Allow it to dry. Glue the bottle cap flat side down to the top of the craft stick at the end not affixed to the wood cube. Leave enough room at the end of the craft stick so you're able to push it down. Allow the glue to dry completely. Place a golf ball in the bottle cap, push down on the craft stick, and fire your new medieval war machine. Lighter objects will travel further when fired than heavier ones. Try various objects and measure their distances. To make the catapult more attractive, you can paint it a uniform color. To avoid injury, never fire sharp objects from your catapult.